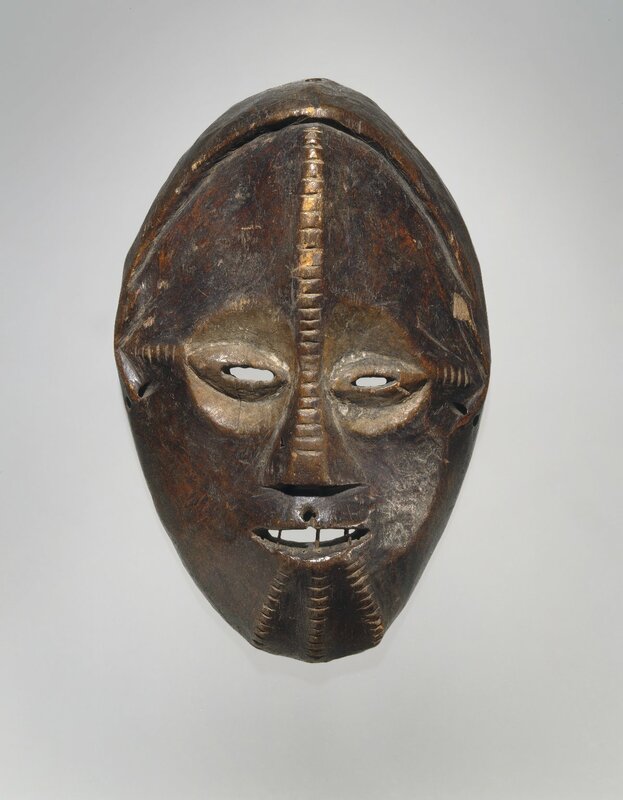 Lipiko masks are used by the Makonde at boys’ and girls’ initiation ceremonies to represent spirits. 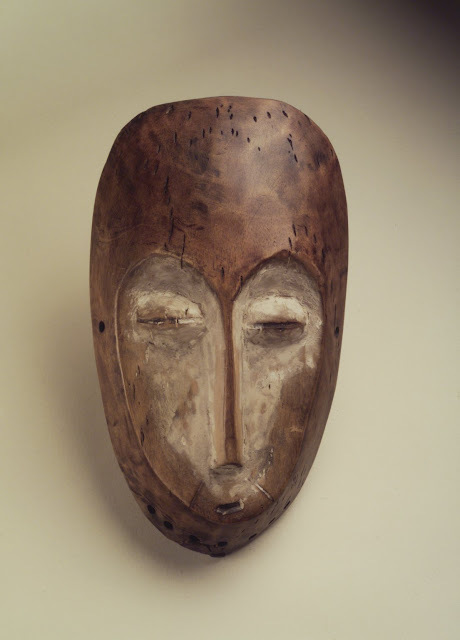 The masks are noteworthy for their realism, each depicting details of a particular facial type and hairstyle. 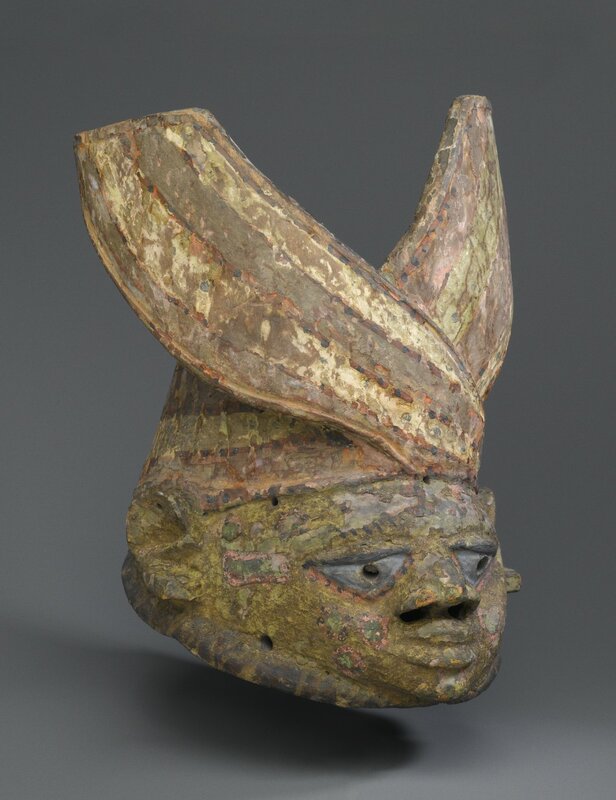 Lipiko masks are often caricatures representing members of neighboring groups, religious leaders, and colonial officials. Among the Kuba, masks are thought to be reflections of nature-spirits (mingesh) that act as intermediaries between the Supreme Being (Nyeem) and the world of mortals. 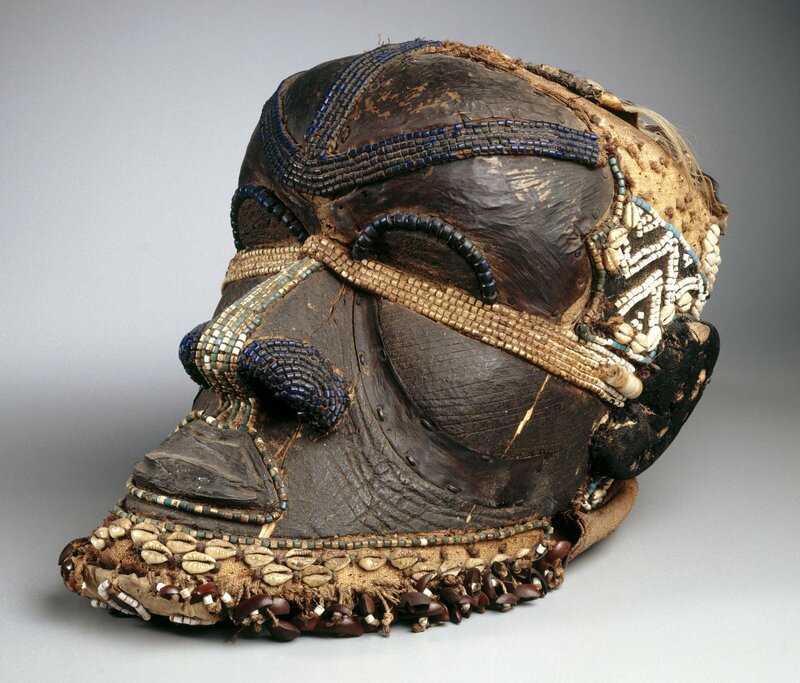 There are more than twenty different types of masks that function within the men's initiation society. Moshambwooy is one of the three most important and represents Woot, the founding hero from whom the Kuba believe themselves to be descended. 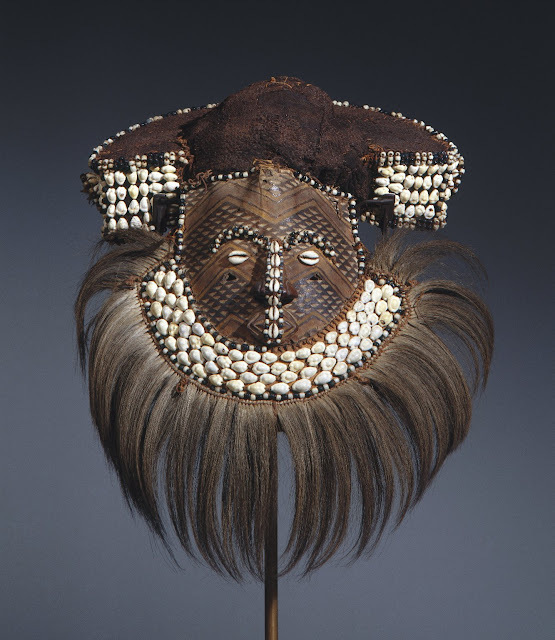 Moshambwooy masks are worn by the nyimi, or king, of the Kuba or by chiefs in villages. 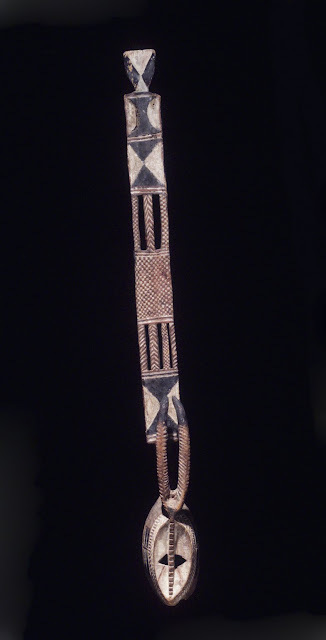 The nyimi's mask is usually made of leopard skin, while those of chiefs are made of antelope skin. 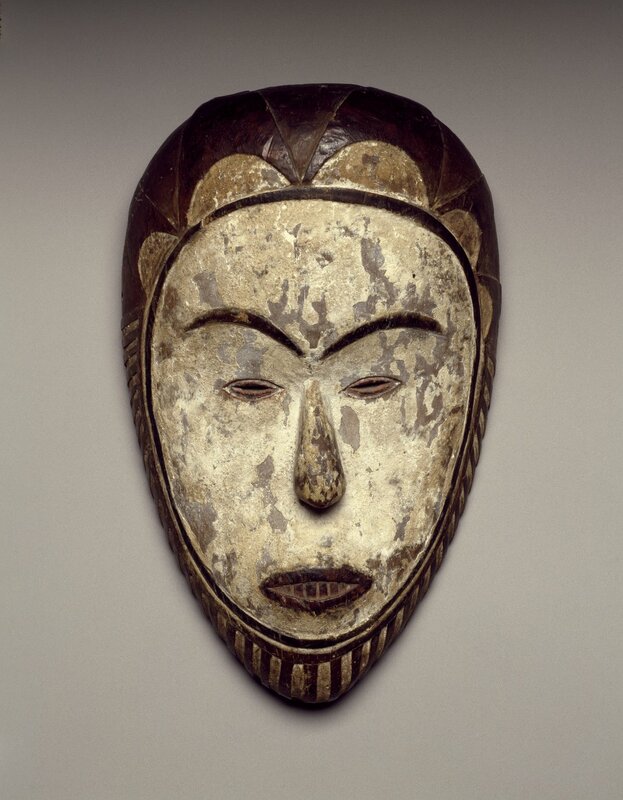 The face of this mask is probably antelope skin painted with a design to look like leopard's fur. The nose and ears are carved of wood, and the white beard of fur from the chest of a sheep represents the beard of an old man. Although little information exists concerning the masking traditions of the many ethnic groups of the Ubangi region in the northern part of the Democratic Republic of the Congo, masks were likely used during the activities which surrounded boys' initiations and circumcisions. 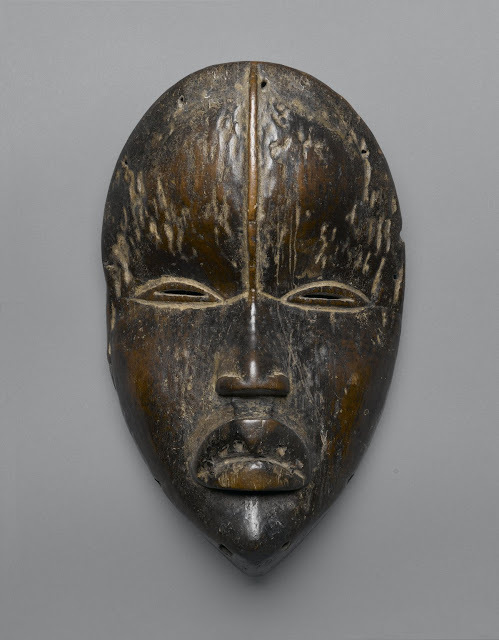 Masks from the region can be identified by their characteristics scarification marks: rows of bumps or incisions running across the forehead and down the bridge of the nose, sometimes extending to the chin. 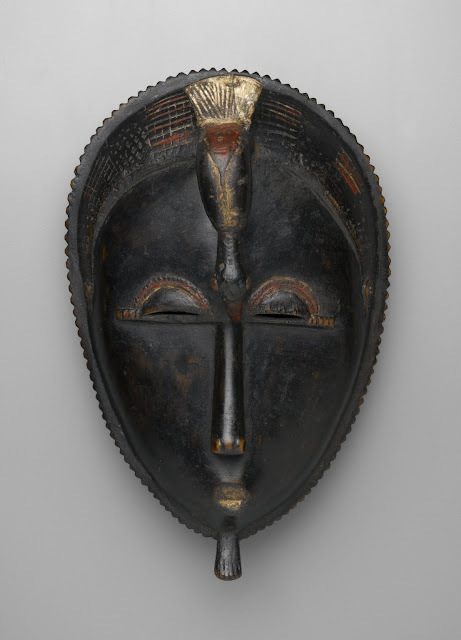 This mask combines many diverse materials to create an image of power. Multiple eyes, warthog tusks, large teeth, and other power symbols such as rifle casings and a beard of authentic and wooden leopard’s teeth form a fierce countenance that frightens away negative forces. We rarely know the names of past African artists, but Ali Amonikoyi is an exception, largely because he was a distinctive artistic innovator. 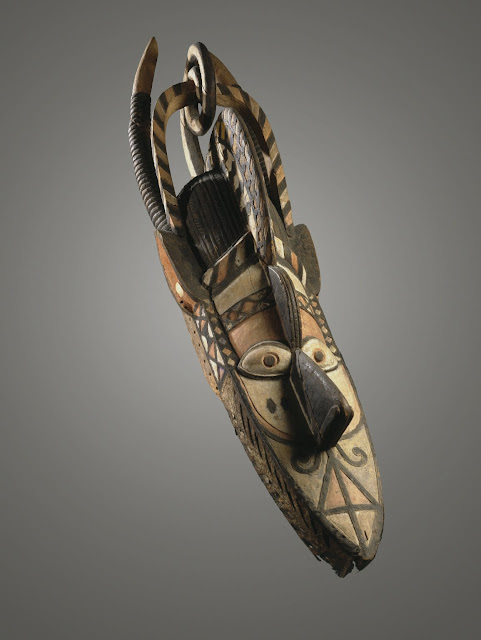 He used metalworking techniques to make objects normally carved in wood and then used these objects in a nontraditional context. 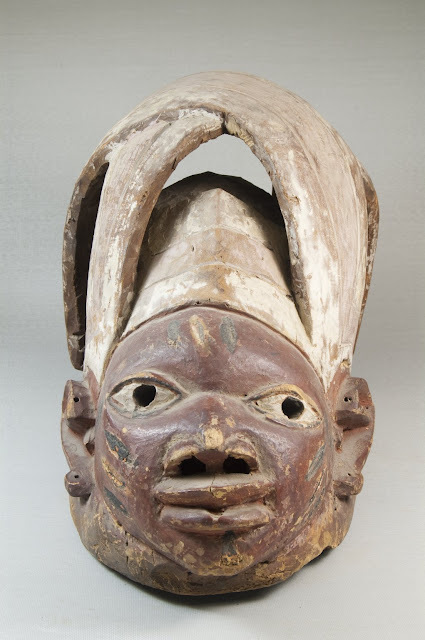 Moreover, he produced his works in proximity to colonial officials who observed and recorded his personal and artistic history. Amonikoyi was a Yoruba born in Nigeria who migrated to Togo. 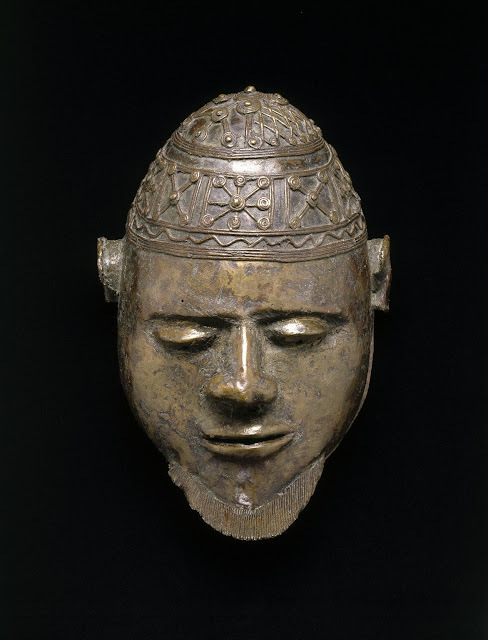 There he used ancient brass-casting techniques to make mask forms resembling Yoruba gelede masks. 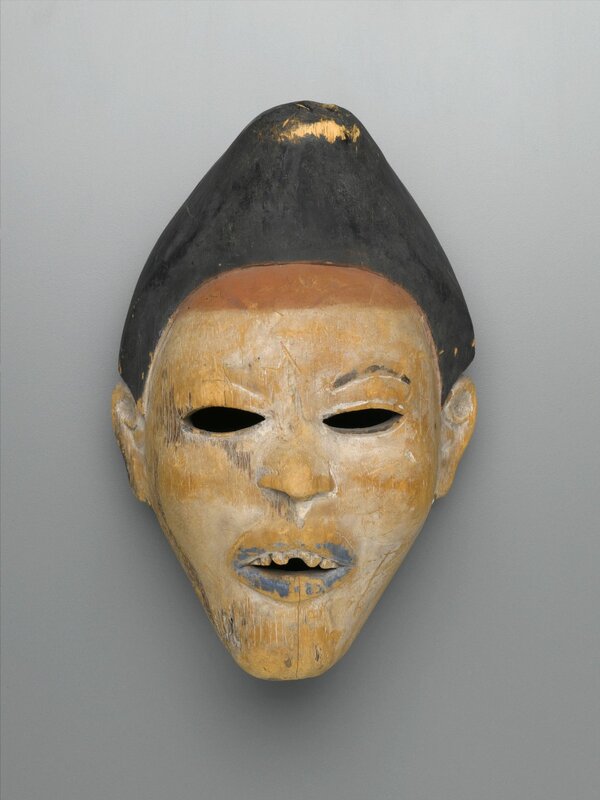 These masks were placed on top of graves as memorials to the deceased, rather than being worn in dance performances. 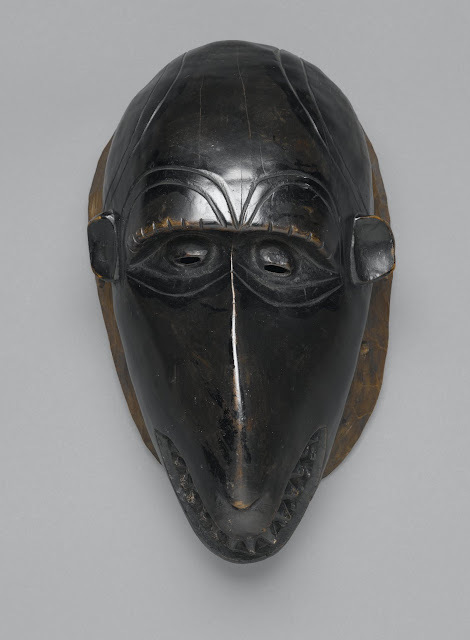 The Lele make masks that have much in common with those of their Bushoong, Shoowa, and Ngeende neighbors of the Kuba kingdom but are much more rare. 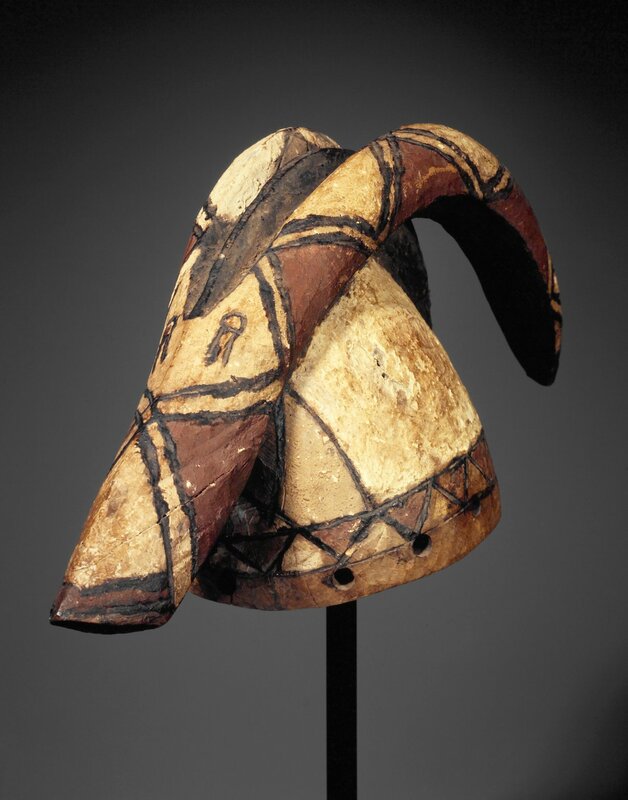 Stylistically, they are usually much flatter than those of the Kuba and are generally decorated with red and white pigments. 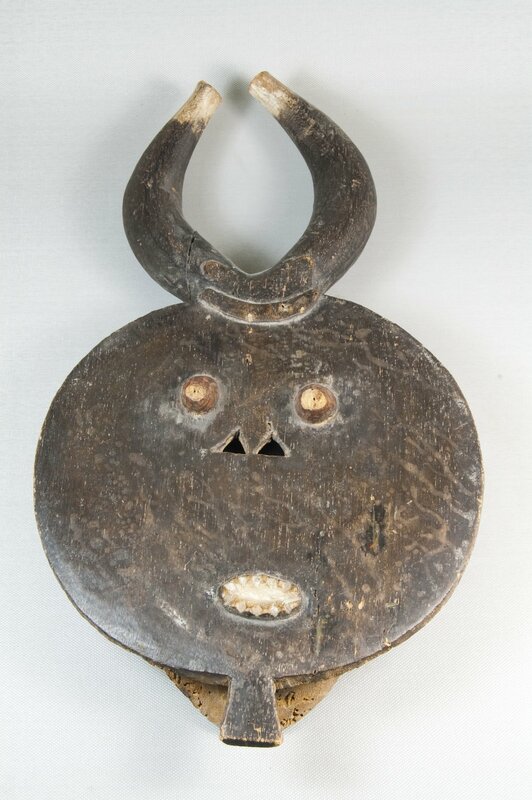 This Lele carver made imaginative and skillful use of pigment to underline volume contrasts such as the convex, almond-shaped eyes–with multiple eyebrows stacked on top of each other to accentuate the eyes–and the pronounced relief of the nose, ears, and cicatrization marks. The masks appear principally at the funerals of chiefs and elders but are also used in annual performances that celebrate and teach the history of Lele origins and migrations. In those performances, they are associated with the founding clans of the communities, who have superior status to the members of clans that arrived later. Karanga masks are danced at funerals in highly acrobatic, dramatic performances designed to emphasize their sculptural height. 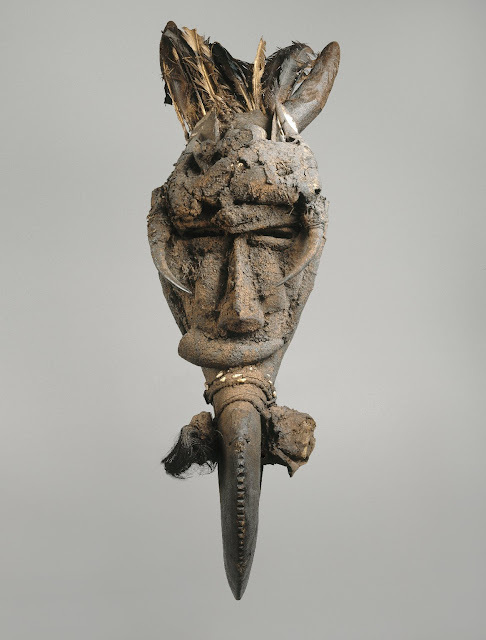 Most Mossi masks take the form of a totemic animal that protects a particular family from harm. This mask may be associated with the antelope, as the two projecting horns suggest. 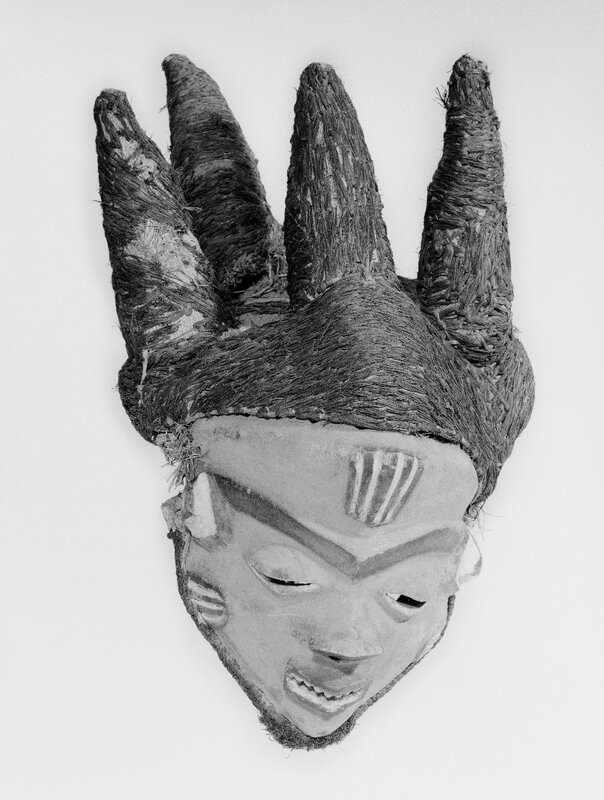 This mask was worn by a Yombe nganga, or ritual expert. Its white color probably represents the spirit of a deceased person. White was also associated with justice, order, truth, invulnerability, and insight—all virtues associated with the nganga. 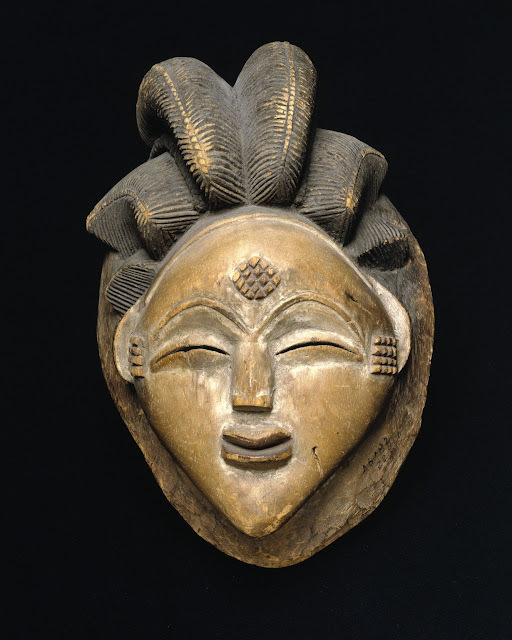 Gelede masks, such as this one, are worn by male Yoruba dancers at festivals honoring the women of the community, living and dead, especially the powerful Great Mothers, including both the elderly women of the community and the ancestors of Yoruba society. The gelede performances entertain and educate, and document elements of everyday life, such as the woman’s head tie in this example. Through their movements, gelede dancers express Yoruba ideals of male and female behavior. 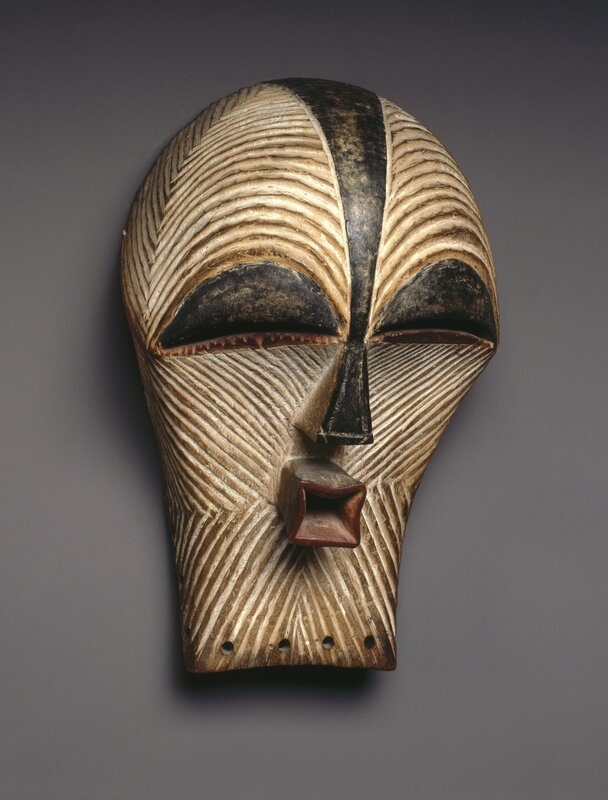 19th century African Mask. 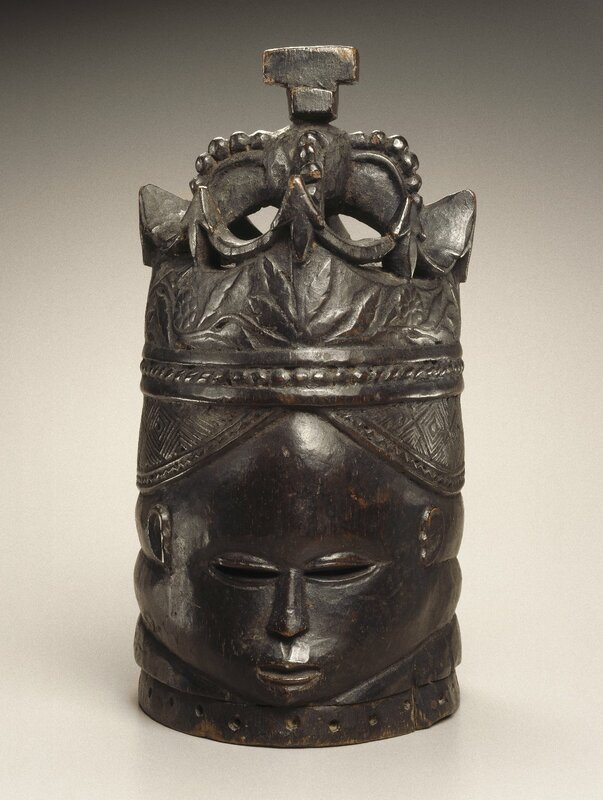 Probably made in Gabon or Republic of the Congo. 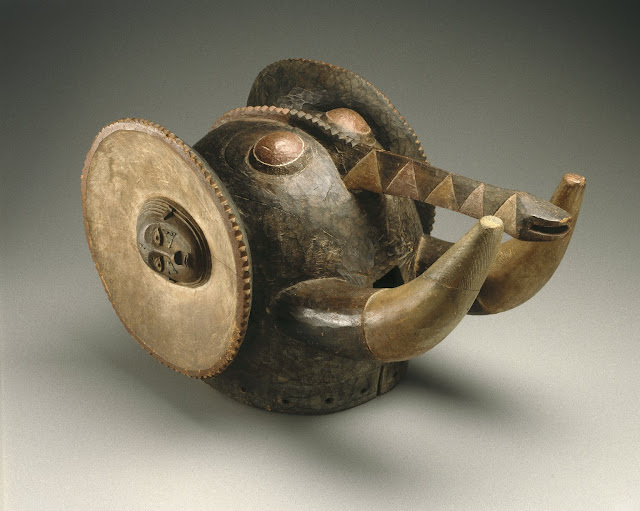 Virtually nothing is known about this mask’s use—not even which of the ethnic groups in the region might have made it. Its geometric abstraction has made it an icon of African art for Western audiences, who have linked its planar volumes with the radical forms of early European modernism, particularly Cubism. 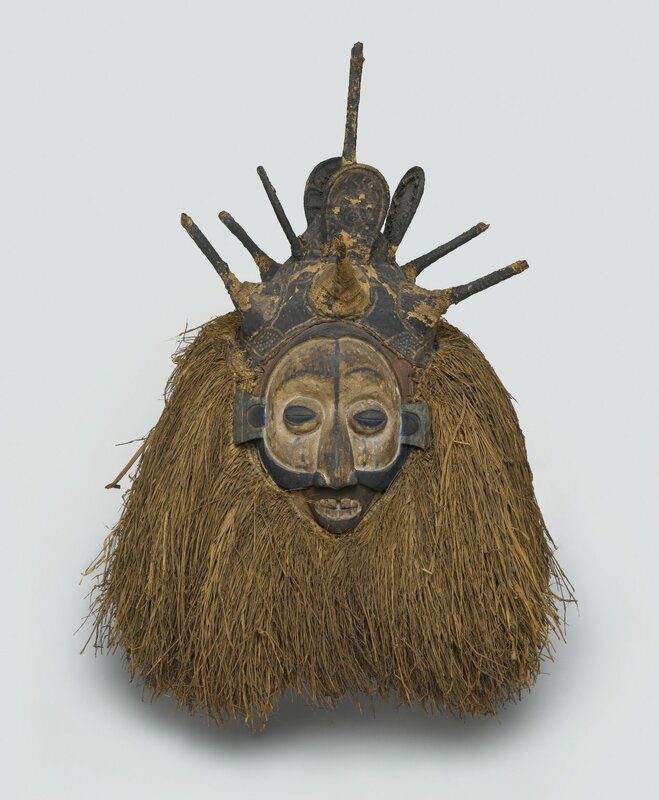 The mask’s white coloring symbolizes peace, the afterlife, and the spirits of the dead—though today its performances are chiefly for entertainment. Kuba mythology revolves around three figures, each represented by a masquerade character: Woot, the creator and founder of the ruling dynasty; Woot’s spouse; and Bwoom. Bwoom’s specific identity varies according to different versions of the myth. He may represent the king’s younger brother, a person of Twa descent, or a commoner. Embodying a subversive force within the royal court, the Bwoom masquerade is often performed in conflict with the masked figure representing Woot. This mask combines human features and those of a crocodile or shark with teeth bared. 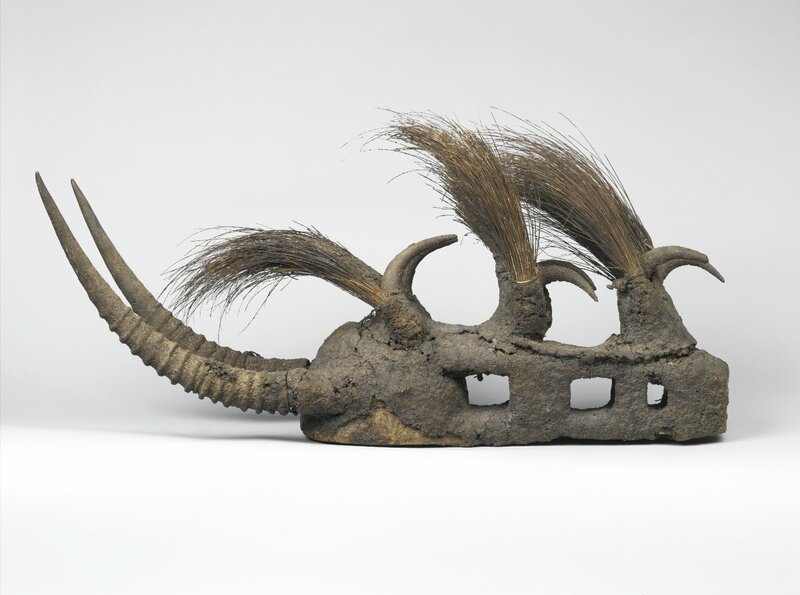 It has the tail of a chameleon, the horns and ears of an antelope, and features of less identifiable animals. Worn horizontally on top of the head, the mask is attached to a skirt of vegetal fibers that covers the body of the wearer. Banda masks were the property of the Simo men’s society, which historically oversaw and regulated fertility and initiation ceremonies. Today it is danced primarily for entertainment. 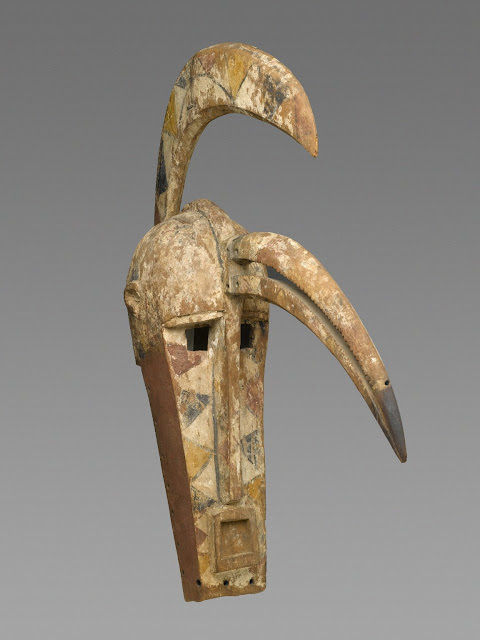 This mask blends features of a hornbill bird, or kuma, with the horn of a buffalo, or tu, combining animals associated with great wisdom and danger. 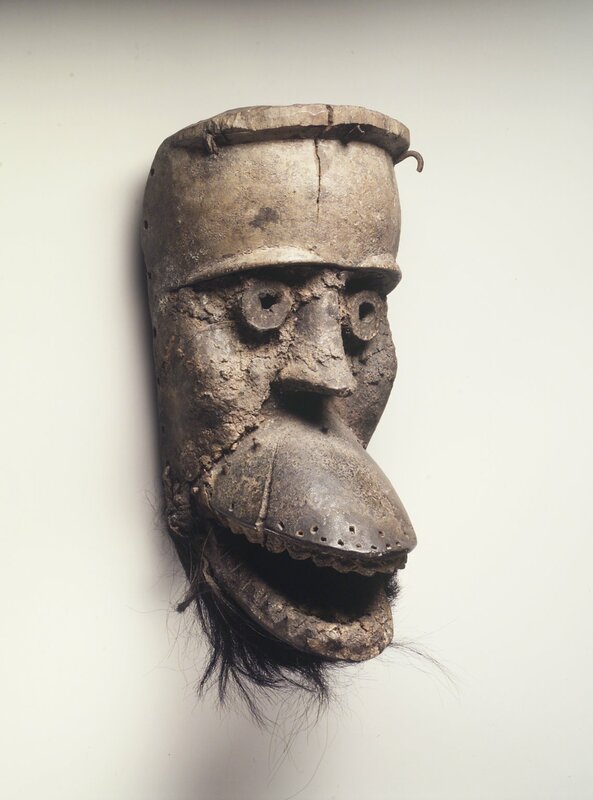 Men wearing such masks perform at the initiation rites to men’s societies, at the funerals of important male elders, and at annual harvest ceremonies. 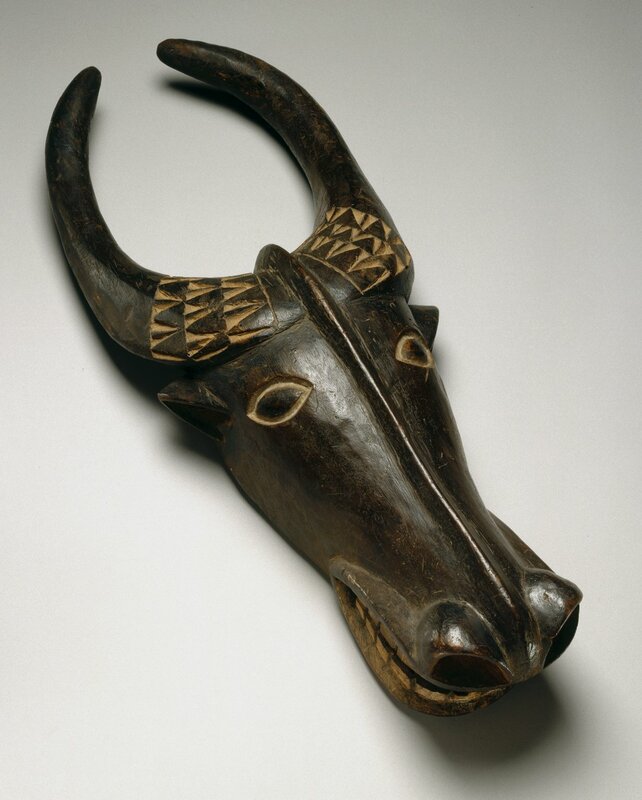 The fact that this mask has only one buffalo horn may indicate that its design was transferred between clans, in which case the original form, with two horns, would have been slightly altered. 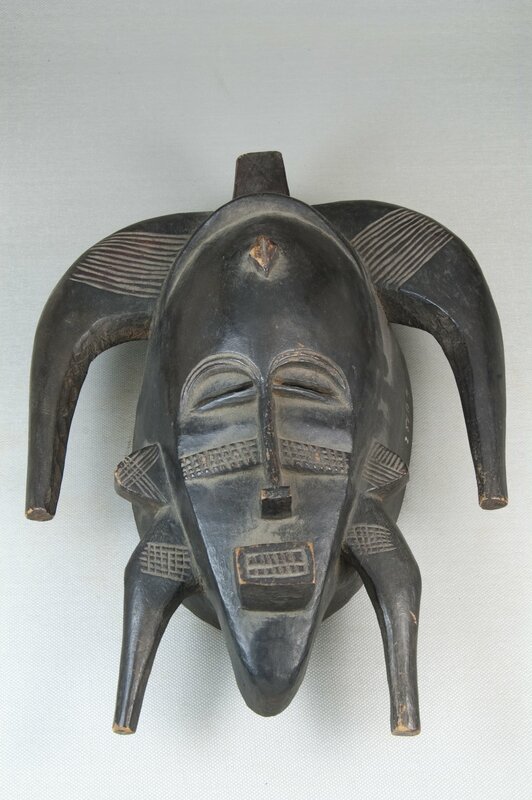 Bamana masks such as this one are worn and seen only by members of the Komo association, whose members harness the power (nyama) contained in the mask to aid members of the community. Powerful materials—including blood, chewed kola nuts, and millet beer—are applied to the mask, while prayers and sacrifices are offered. The open mouth and the horns, tusks, and porcupine quills symbolize the Komo’s power to punish those who violate its rules. 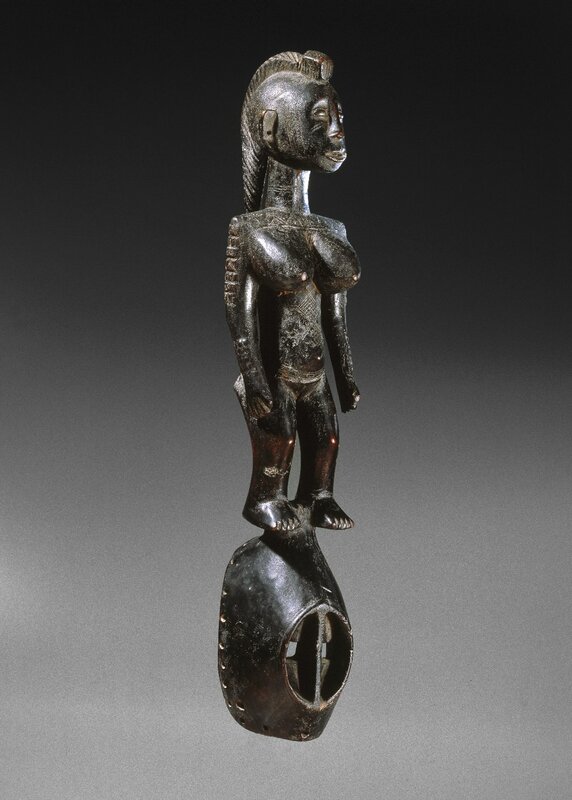 The female figure atop this mask represents a married woman who has just given birth to her first child—a moment when a woman is considered to be the most beautiful by the Mossi. 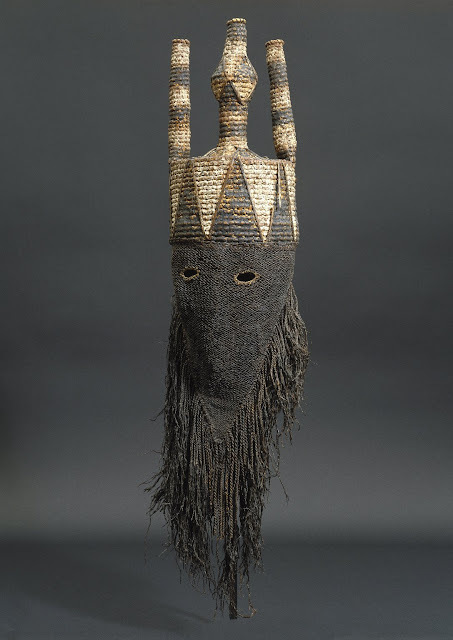 Such masks are danced at burials and celebrations to honor the spirits of deceased female clan elders. 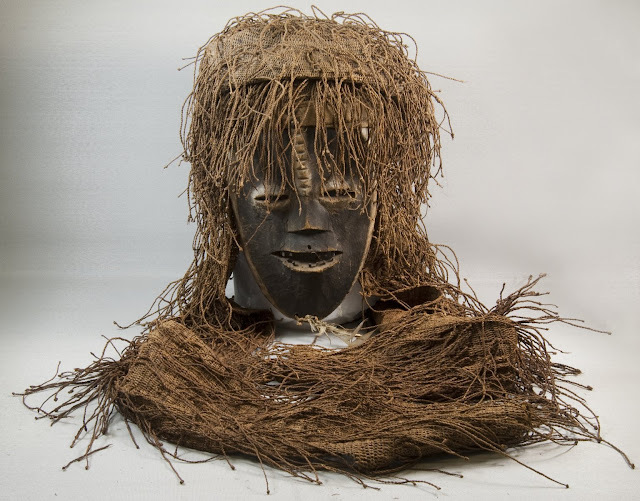 The kifwebe masquerade is a genre shared by the Luba and Songye, indicative of the interaction that has occurred between the two societies. 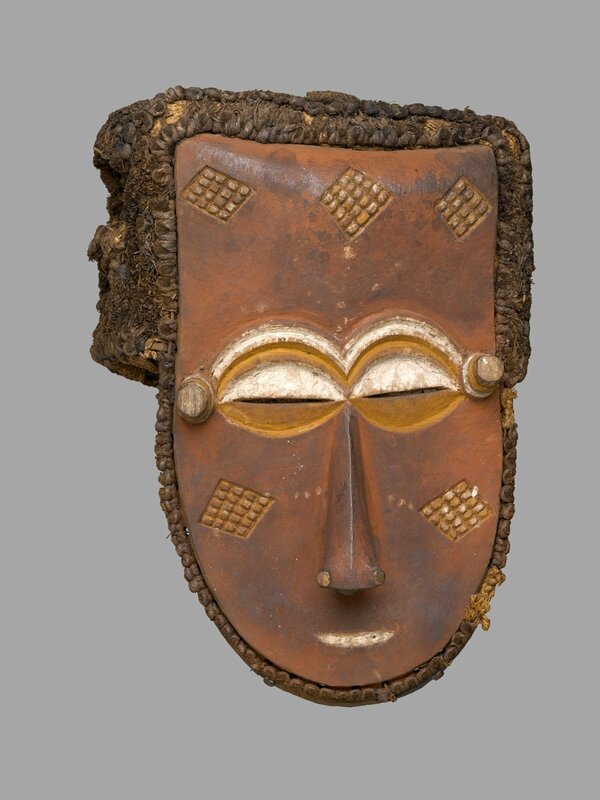 Kifwebe masks represent either male or female beings. Both mask types are characterized by angular and thrusting forms, and in both cases the entire face is covered in patterns of geometric grooves that are uniquely characteristic of these masks. Female masks, such as this one, are distinguished by the predominant use of white clay and the rounded form of the head crest. Historically, Dan society vested political leadership in a council of elders. 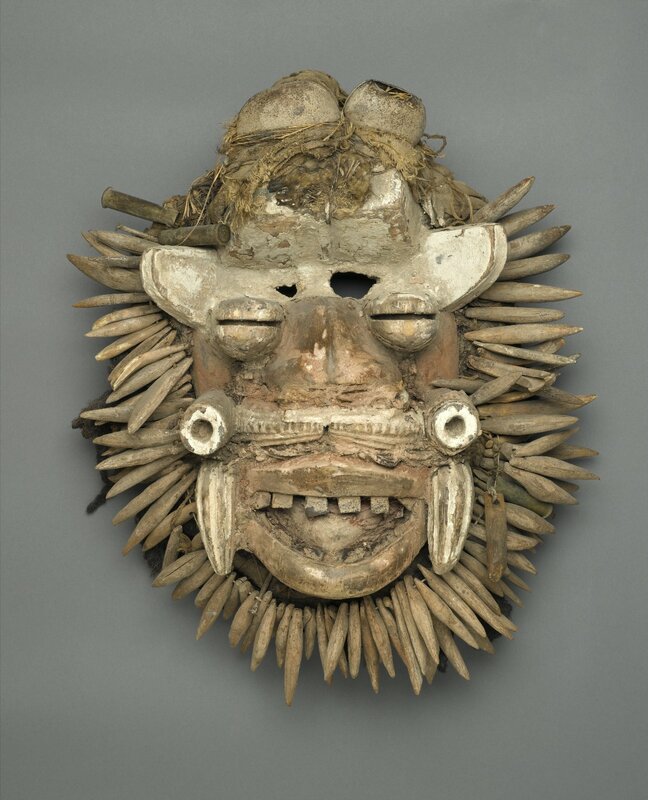 Masks served as agents of social control, enforcing the council’s rules and orders. 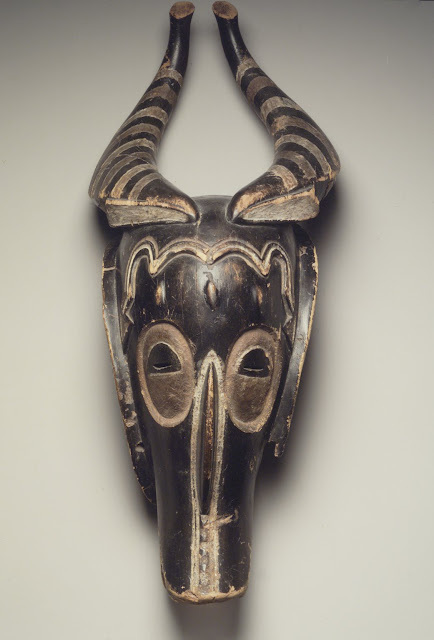 The masked figures were believed to be incarnate spiritual beings capable of rendering unbiased judgments. 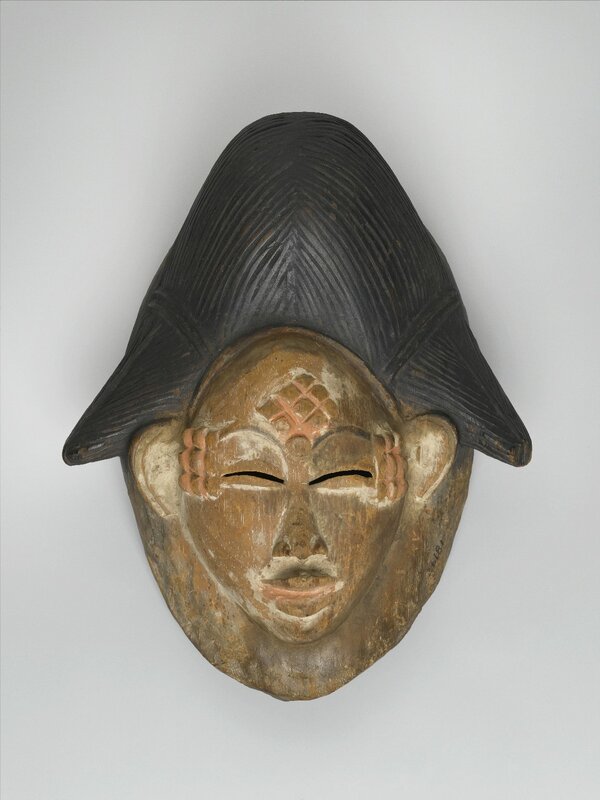 The specific functions of individual masks, once removed from their village contexts, are impossible to determine. 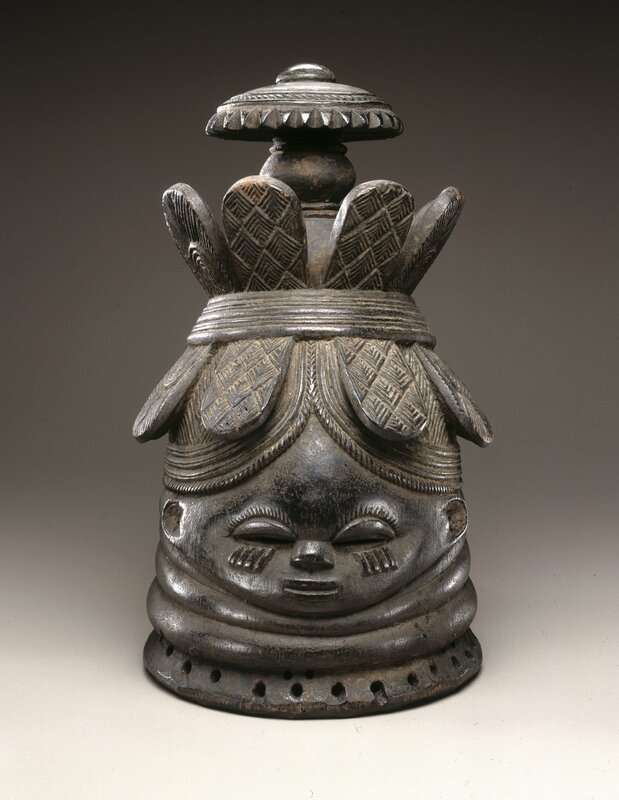 Here, the nearly closed eyes and small mouth contrast with those of other masks and probably indicate that this example served in a peacemaking function and generally created harmony in the community. 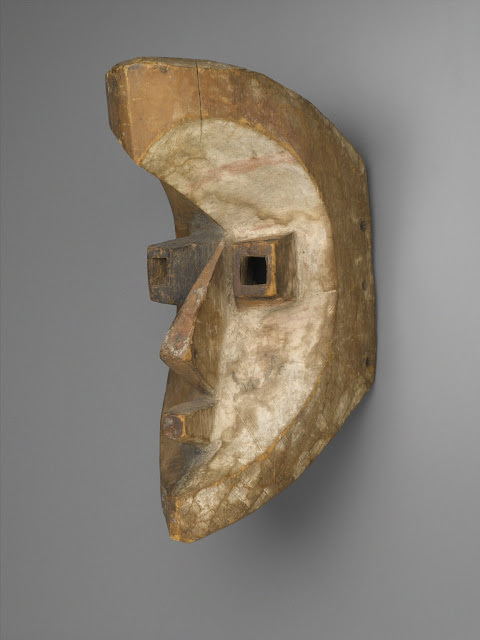 Little is known about the functions of masks such as this one, since they fell out of use by 1910. 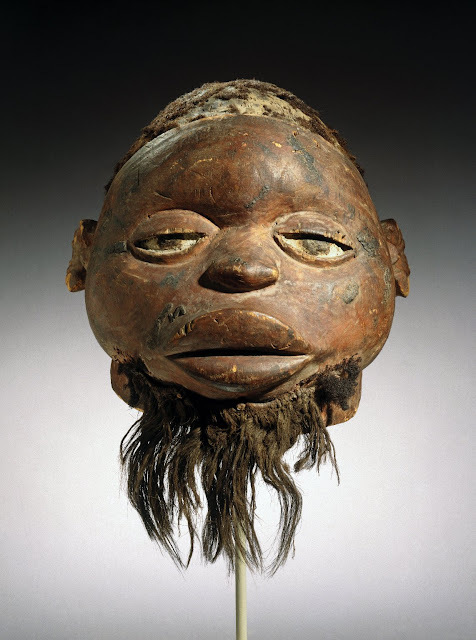 It is thought that they might have had a role in boys’ initiations into adulthood. Among the Fang, the spirits of the dead are associated with the color white, suggesting a connection with the ancestral realm. White clay (kaolin) is also used by healers in medical practices. 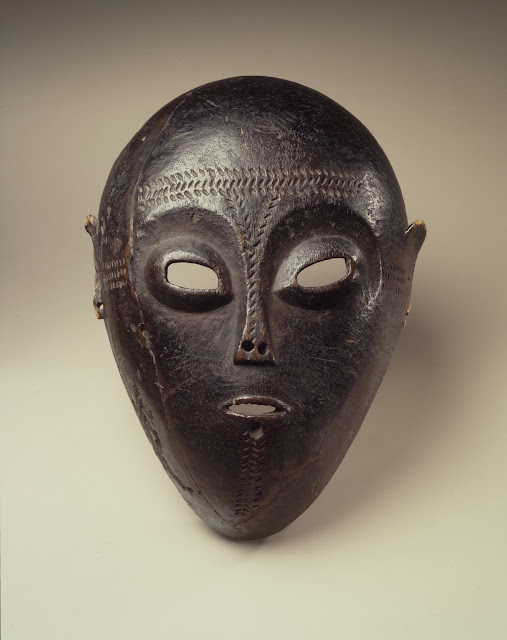 This face mask could have been related to either set of practices.